This came up again recently with Ex-Angel Grich is a no-brainer Hall of Famer By SAM MILLER of THE ORANGE COUNTY REGISTER. Hat tip goes to Baseball Think Factory. I have written about how good the case for Grich is before. Here is some info I just compiled, using Baseball Reference. The only AL player with more WAR from 1973-6 than Grich (26.2) was Reggie Jackson (26.3). In a 10 year period, Grich had 5 top 5 finishes in the AL in WAR (among position players). From 1972-76 he was 5-2-1-4-6. He had 7 top 10 finishes from 1972-81. Grich actually beats Jackson 32.0-31.8 in WAR in the AL over the years 1972-76. Looks like good peak value. My guess is that many Hall of Famers don't have even that much peak value but that would require looking at all of them. Grich had 67.6 WAR for his career, good enough for 65th among position players. Here are the top 15 among second basemen (playing at least half their games there). Grich is 8th, while Whitaker is 7th and may have a good case, too. Here is how Grich compares to six other second basemen who are in the Hall. He had more top 5 finishes in WAR than all of them and only one had as much WAR in his best consecutive 3 seasons. 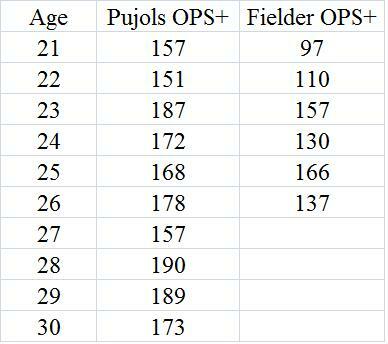 Will Prince Fielder Surpass Albert Pujols? On Monday night before the Brewers game, a commentator on ESPN said something like "now that Fielder is entering his prime years, his numbers will surpass those of Albert Pujols." This seems hard to believe. 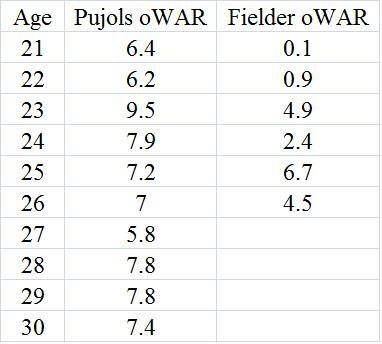 Fielder generally has not hit as well as Pujols at the same age. Since he is in the news, I thought it would be good to revisit. I have written about this before and there are some links below. 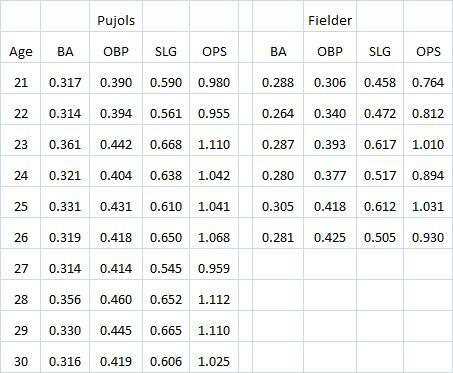 This table shows his neutralized SLG as he aged from Baseball Reference. This means that it was adjusted for the league average and park effects. Notice how his 4 best years are clearly from 36-39. This seems to be highly unusual and I think his improvement at those ages over what he did earlier is much better than anyone else's improvement. Can "Pitching To Contact" Lead To More Scoring? See Are Twins Taking "Pitching To Contact" Too Far? by Rob Neyer. 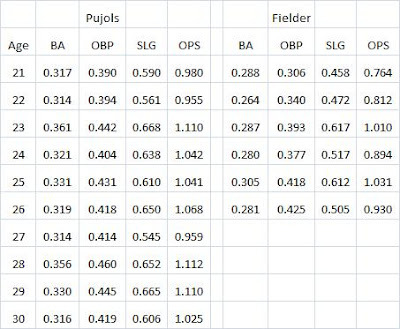 To look at this, I calculated the batting average and slugging percentage in the AL in 2010 on contact. For contact, I used AB - K + SF. I assumed that sacrifice hits (bunts) and their attempts rarely end up in strikeouts. 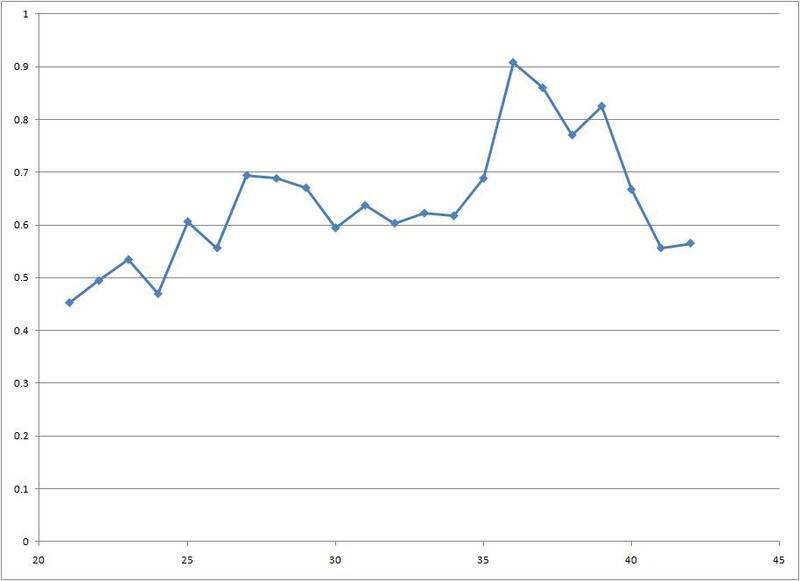 So in the AL last year when a plate appearance ended in contact, the AVG was .320 and the SLG was .501. I am not sure if this approximation works. 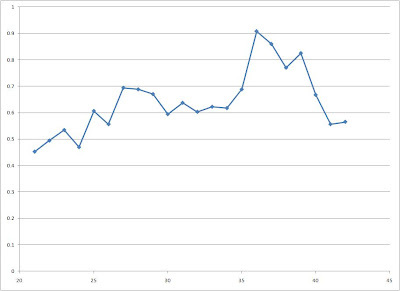 It would be quite a different game with no walks and the denominator for OBP and SLG is not the same in each case. But even with that said, I am skeptical that pitching to contact (or not trying to cause batters to miss the pitch) is a good idea. Did Minnie Minoso Have Enough Peak Value To Make The Hall of Fame? Rob Neyer's Measuring Minnie Minoso's Hall Of Fame Case got me thinking about this. He might have enough peak value using WAR. His career WAR is not bad at 52.8, which is 152nd among position players (from Baseball Reference). Minoso had 7 top 5 finishes in the AL including 1st place in 1954 and 1959. He was also 10th in OPS+ for players with 3000+ PAs in both leagues. That means Minoso averaged 26 Win Shares per season. I don't know if any of this is enough to get him in, but his case is better than I thought. Just checked at Baseball Reference and so far the league SLG is .449. That would break the record for a whole league of .448 set by the NL in 1930. The AL has an ISO of .184. That would break the record the AL set in 1996 of .168. The Rangers have a .775 SLG with a .442 ISO. The Blue Jays have an ISO of .283, the Angels .239 and the Yankees .210. Was Roger Maris More Deserving Of The MVP Award In 1960 or 1961? I am not sure he should have gotten it in either year, but if he had to get it, 1960 was actually the better choice. This is inspired by Baseball and the Value of Sabermetrics: An Author's Perspective. It was an interview at Bleacher Report of author Alan Hirsch who wrote the new book The Beauty of Short Hops (Hat tip: Baseball Think Factory). "Q: What about the fact that Maris, by some measures, was actually as good or better in 1960 than in 1961? In 1960 Mantle mostly hit in front of Maris, not behind him. And Maris only had four intentional walks in 1960 hitting mostly in front of the rather mediocre Bill Skowron. Should we question the impact of Skowron on Maris’ performance in 1960, the season in which he was probably more deserving of the MVP award? AH: First, I’d take issue with the suggestion that Maris was as good in 1960 as in 1961." Maris 1960 vs. Maris 1961 is a very close call. But it looks like if he was deserving of the MVP, 1960 was the better choice. In 1960, Mantle beat Maris in WS 36-31 (they were 1-2). In 1961, Mantle beat him 48-36. Mantle was 1st, Maris 3rd. Cash had 42. So that tells me he was not deserving in either year, and even less so in 1960. Here are the leaders in runs created above average in each year. In 1960, Maris was at least close to the leader. But in 1960 he was way back. Breaking News! White Sox Get Obama!